The Ministry of Youth Affairs and Sports has approved financial assistance from NSDF to Chain Singh, Shooter for training and other support as part of preparation for Olympics 2016. He has been allocated a budget of Rs 40.00 lacs under the scheme. There is no objection for Col Lalit Sharma accompanying you at no cost to Government; Indian Army may consider funding the foreign trip of Col Sharma. 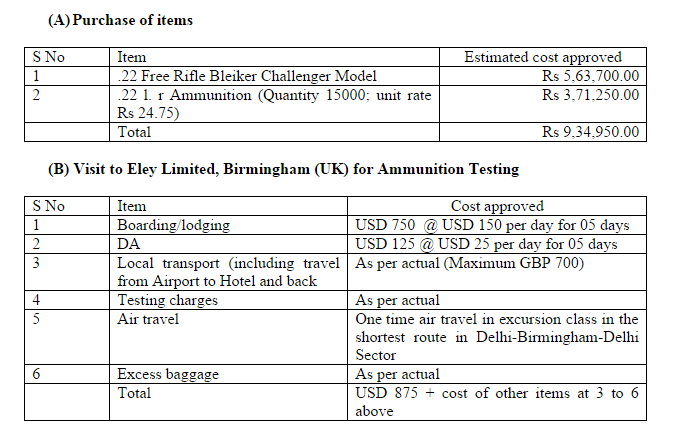 b) USD 785 (US Dollar Seven hundred eighty five only) and GBP 630 (GBP Six hundred thirty only) for visit to UK for ammunition testing.